When the stock market falls and credit spreads remain stable, this is many times a short-term dip and ultimately a buying opportunity. 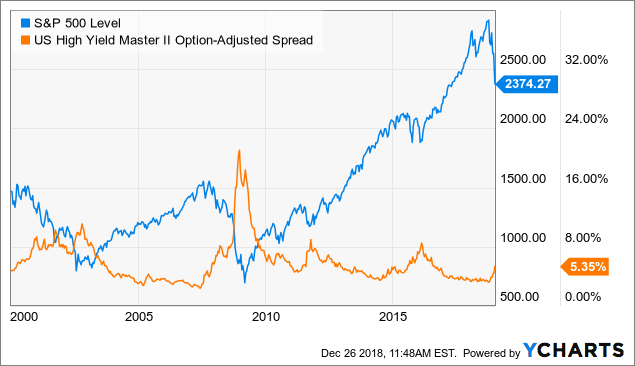 On the other hand, if credit spreads are increasing as the stock market is falling, this can signal that the situation is far more serious and concerning. For illustrative purposes, the chart shows the evolution of the S&P 500 and high-yield credit spreads since 1999. Watching the credit markets can be particularly important in the current scenario since corporate debt levels in the US is at new historical highs. This generally tends to happen near the end of the expansionary economic cycle, and factors such as the trade war, slowing economic growth in China and Europe, falling liquidity from the Fed, and the political uncertainty coming from Washington are putting considerable pressure on financial markets. If we see a sustained increase in credit spreads going forward, highly indebted corporations could be particularly vulnerable to all kinds of problems. The following quantitative system is available in real time for members in The Data Driven Investor, and it's based on managing risk exposure in the stock market by watching the main trends in the credit market. We start by creating a ratio that measures the relative performance of iShares iBoxx $ High Yield Corporate Bond (HYG) versus iShares 7-10 Year Treasury Bond ETF (IEF). When this ratio is rising, it means that high-yield bonds are outperforming Treasury bonds, so risk appetite is increasing and credit spreads are falling. Rising risk appetite in the bond markets is usually good for stocks too, and vice-versa. Disclosure: I am long SDS.